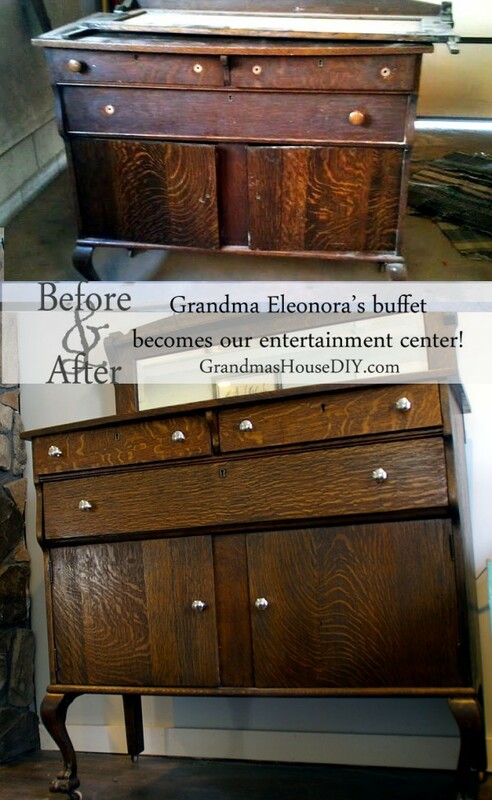 Eleonora’s beautiful buffet gets converted into my entertainment center! This post is actually not about the Grandma I talk about so much (the wonderful lady who inspired this blog, who lived in this beautiful old farm house before her passing a few years ago) No, this post is about a different, my dad’s mom Eleonora. When she passed they gave us grand kids full run of her house with the notion that we needed to take whatever we wanted to remember her and grandpa by. To say the least, none of us really wanted to do anything let alone go through Grandma’s far too quiet house. But, of course, we did, and we’re all glad that we did. I chose this gorgeous old buffet with the stunning little claw feet and the amazing mirror with only an inkling that it may be my entertainment center some day. It was missing knobs and one of the feet was danging by a screw and an old fix made long ago, it was also in pretty rough shape all in all. It needed love, it needed me. I refinished this old beauty at the same time that I did this one: The Ancient dresser from nowhere. Side by side I went from one to the other, sanding my arms off. Since then I have seen many other alternatives to removing the old, sludge-like finish on these ancient pieces, I have also been yelled at for removing it at all. But, the truth is, after so many years with the old coats of stuff on them, these pieces really get just totally covered up with grime. Once I started to see the grain on this one I got really excited and knew I was on the right track! I chose a black stain that turned out a lot less black then I had thought it would be, later I realized I had chose a gel stain that had settled to the bottom and had been using a brush where I should have been using a rag. However, I am very happy with how this piece turned out. I used a satin poly on it so it would shimmer instead of shine. Then, for the first time since I refinished this pretty old thing I got to the put the mirror back on it! I did a little dance, I really did! So, the old velvet lined, divided drawer, made just for silver, now holds my wii remotes and console controllers and remote controls and if that’s not a direct example of how one generation has changed to the next I don’t know what was. This old buffet was up in my Grandma’s attic, almost totally covered up, I love that she’s out now as my entertainment center for everyone to admire when they come into my home. The other two finds I got from my Grandma Eleonora are the rocking chair I upholstered and the white leather tufted hassock that you’ve probably heard me mention before. I see and use all three of them every day and every day I remember her. Meg, it is easier then it looks! It is also much more time consuming and dirtier then I ever thought it would be lol. But wood is so forgiving! Thank you for commenting! The story is as beautiful as the buffet. Thanks for the inspiration. It’s beautiful. Satin poly is always a finish I prefer. Subtle and rich looking. Thanks for sharing with us on Thursday Favorite Things blog hop. What a beautiful job you have done Tarah. In this case, you have restored the actual piece and made the grain shine through. I am hosting a new link party Sweet Inspiration and would love to have you join us. It runs Friday till Tuesday. Thank you so much I’ll definitely go and check that out!! 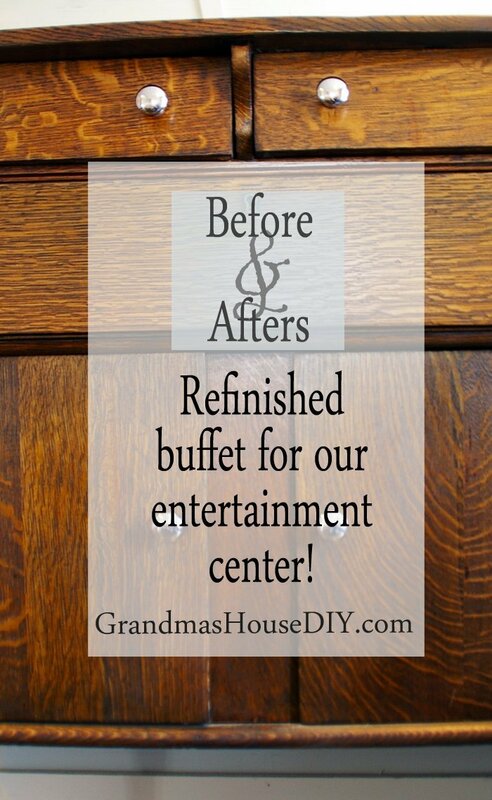 Wow, you did a beautiful job restoring your grandmother’s buffet! This is such a beautiful piece of furniture! I completely understand the grandma connection. I miss mine everyday. Thank you for sharing with Thursday Favorite Things Blog Hop. Its so neat to be able to have some things of my grandma’s to remember her by 🙂 I feel like I “saved” this old piece and it really makes me feel like she would be glad! Thank you for stopping by! I have a piece almost the exact same as this (except different feet and the one long drawer is below the doors) that I’m planning on making my entertainment center! It’s been sitting in my garage for almost a year now 🙂 Did you do any modifications to this buffet to allow the wires to come in and out? Would love to know more of your process! 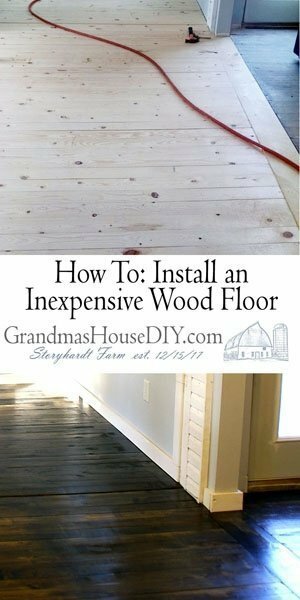 And thanks so much for linking up to Fridays Furniture Fix! We haven’t modified the buffet yet actually. I’m really a little stuck with the idea so far – We thought of removing the long drawer and putting in a board across it to make it a “shelf” to keep our tv components but I am incredibly attached to that beautiful drawer… Other thought was to keep the components in the bottom and just open the doors when we need to use them but then we’re going to have the doors open all of the time! I think I’m going to bite the bullet – remove the drawer, drill a hole in the back of it for the cords, and put a board in to make it a shelf and just stain it to match the piece 🙂 Hope that helps! Thanks for stopping by! Grandmother’s buffet is so beautiful. I am glad you restored it to its original beauty. Mimi, thank you so much!! Wow!! Just beautiful! thanks for sharing on the Pleasures of the NW’s DIY party. You did a fantastic job on the refinishing! I love how you use it for an entertainment center, and that you think about your Grandma every time you see it. That is what keeps our loved ones who have passed with us always, our memories. 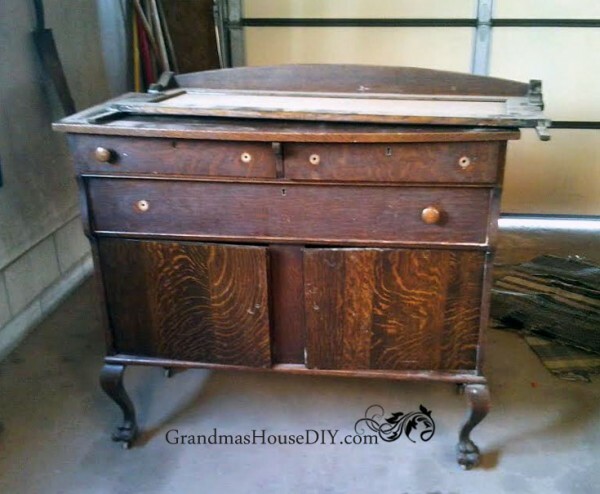 We have been looking for something old and wonderful to use for an entertainment center also. I’m inspired by yours and will be looking for something like that. Is that wood oak? 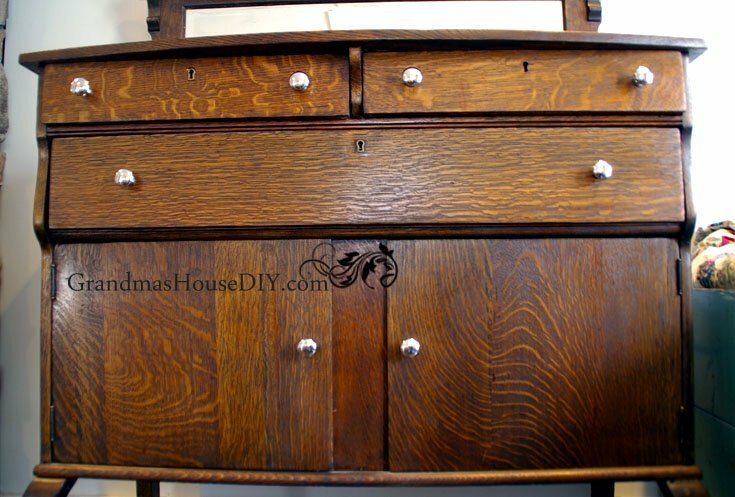 The wood looks similar to an old oak dresser that I have from my childhood. Have an awesomely blessed day! Thank you SallyAnn! Next up I need to force myself to part with one of the drawers so we have a place for our electronics 🙁 Its been almost a year and I still haven’t managed it lol! All the drawers are just so cool and beautiful! I believe the entire thing is solid oak 🙂 Thank you for coming by! Nice job, Tarah! The wood is just beautiful. Thanks you for sharing with #overthemoon! What a beautiful piece of furniture!! Well done! 🙂 Thanks for sharing on My 2 favorite Things on Thursday! Pinned! Thank you so much Vashti!! It’s beautiful. Thanks for sharing at Home Sweet Home! Everything you do turns out amazing! Thanks for sharing your links with us at Celebrate Your Story. Have a wonderful holiday! I think you did a greatjob! While there are some antiques that shouldn’t be touched because they’re of great value, or from a famous maker, I don’t think you could have gone wrong, here! I be your Grandma would have been proud! Thanks for sharing this at Throwback Thursday this week. You did a beautiful job, it looks like it can last another 30 years now.! Thanks for joining the DI & DI Link party. Have a great week. 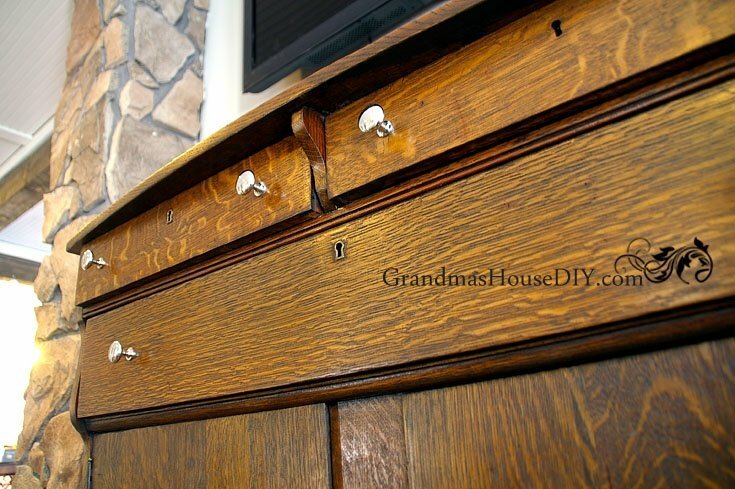 What a great way to keep your grandparent’s memory alive by having their furniture, refinished, used, and be housed in your home. My husband has a few pieces from his grandfather’s house as well and, as a family, we cherish these pieces and always find ways to use and reuse them. 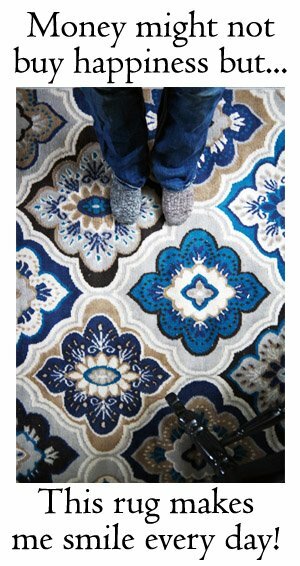 Thank you so much for sharing your story and this DIY with us on #shinebloghop! Thank you so much Maria 🙂 I loved that when my husband and I moved in between us we practically only had to buy a couch lol after that all of our furniture came to us from our parents or grandparents! It turned out so lovely! Thanks for sharing at the #InspirationSpotlight party. See you again soon. Shared. What a beautiful piece ! Thank you so much for joining the Family Joy Link Up this week. We hope you will come back again next week. Have a great week! Stopping in to thank you for sharing at Homemade and Handcrafted! 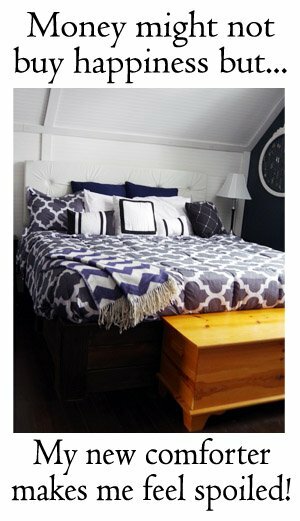 This wonderful makeover is featured this week and I hope you’ll stop over to share more. Oh Robin thank you so much!! This turned out great! I’m going to be redoing my first piece of furniture soon and I can’t wait to see how it goes! Good luck Pam, I’m sure it will be wonderful! So nice to have so many family heirlooms to bring back to life and enjoy, and I do love a great refinish job with great grain, just beautiful! Thanks for sharing your project at Fridays Furniture Fix, love having you! Thank you so much Brenda, so appreciate parties like the Furniture Fix! Its wonderful how you take the time to relate the history of the pieces you have, its nice to read stories about your grandmothers. You did a great job of refinishing this, it would have been such a waste to cover up the tiger wood stripes. Beautifully done. You have so many beautiful pieces of furniture. I really love this piece. You did a beautiful job. It’s beautiful! Thanks for sharing at Sew It Cook It Craft It! Beautiful! Much nicer than what you could buy! Love it!